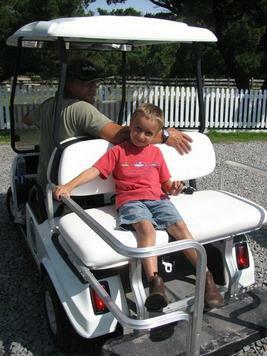 Ocracoke Island Golf Carts offers hourly, daily, and weekly golf cart rentals. Our large fleet of 4 & 6-passenger golf carts are easy to drive, well-maintained, and equipped with seat belts and lights. Enjoy exploring historic Ocracoke in one of our electric carts. Convenient, affordable, & fun! Renting is easy! Call us (252)928-0090, go to our Reservations page, or stop by our rental office along Silver Lake Harbor. We are located in the heart of the Ocracoke Village, across from the Anchorage Inn. We are within walking distance of the public parking area and south ferry dock. Look for our red & green bull's-eye logo! We open daily at 8am, March-November. Please see our Rates page for pricing and our FAQ page for rental information. We offer free delivery/pick-up for weekly rentals, as well as child seats as needed. We take reservations year-round. Our staff are always ready to help! We are proud to be a locally owned and operated business in our 10th year of operation. Ocracoke Island Golf Carts was the first golf cart rental business on the island, starting out with just a handful of carts. We love Ocracoke Island and welcome you to this magical place in the world. We hope you enjoy your visit!